The 1960s and early 1970s truly were a golden era for the sports car, one that took another 30 years to fully return. To replace the fun but sometimes challenging machinery of that age, we’ve got some great sports cars like the Miata, Elise, and BR-Z/FR-S, and that’s only a short list. While cars like the Triumph TRs and MGB were best sellers, other cars like the Opel GT enjoyed a respectable amount of success, selling just over 100,000 cars in its 5 years of production. 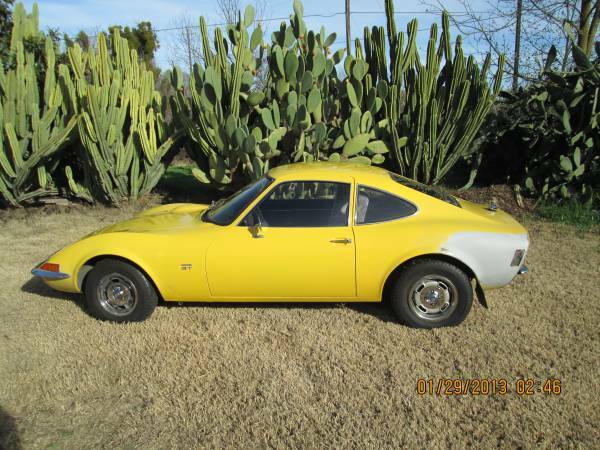 Check out this 1971 Opel GT for sale for $4000 in Stockton, CA. The factory sunburst yellow color still looks great, particularly in front of these cacti, barring the primered area behind the rear wheel. It would be interesting to know whether the primer was due to corrosion or collision, but it shouldn’t be too costly to have this area filled in by a qualified paint shop. The car is said to have been on non-operative registration since 1995, with an engine rebuild dating back to the early 1990s. 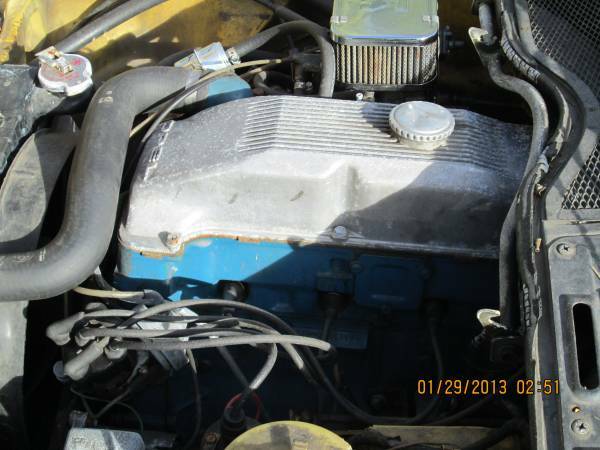 The buyer calls the car solid, and says it runs and drives. 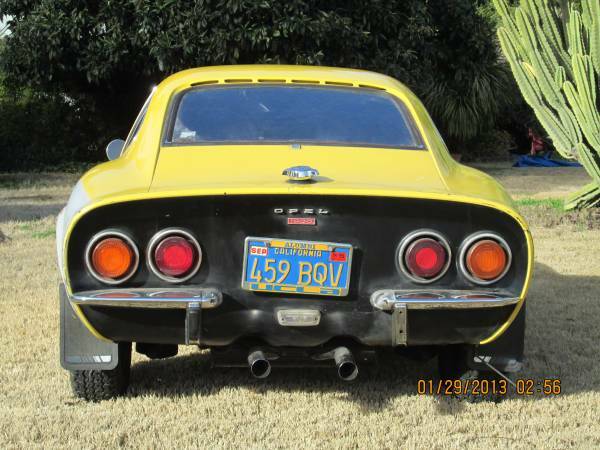 The blacked out rear panel recalls sports/racing cars of the sixties, and the blue California plate and period UCLA frame suggest long-term California residence. Wow, that fuzzy steering wheel cover needs to go – it’s like the fuzzy toilet seat cover in grandma’s house, who knows what’s buried in that fur. 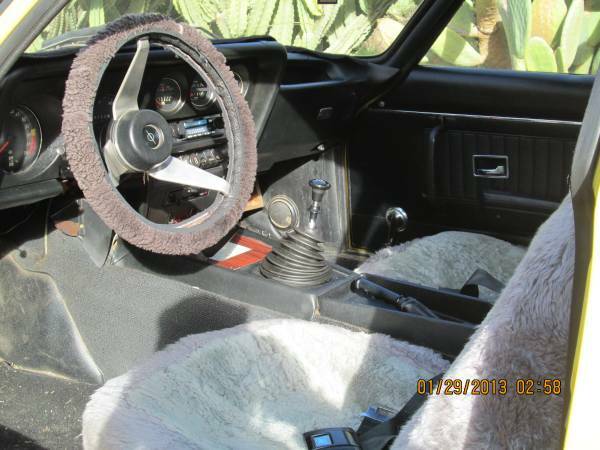 Assuming the seats are intact, those covers can be trashed too – the rest of the interior looks to be clean and complete, and it’s nice to see this one is a manual transmission car. Quite a few were sold with automatics, which has to take the joy out of driving any classic sports car. The 1.9-liter engine looks reasonably clean for a driver, and will probably need some attention to ignition, cooling, and lubrication systems following its 20-year slumber. From 1971, GTs received a lower compression engine to comply with emissions rules, resulting in a reduced output of 83hp. It would be interesting to know if the rebuild restored the higher-power spec, or whether you could improve things by changing out the carburetor or cam. Can you get over the honey-I-shrunk-the-Corvette jokes enough to run this as your weekend driver? This entry was posted on September 12, 2014 at 11:39 am and is filed under Feature. You can follow any responses to this entry through the RSS 2.0 feed. You can leave a response, or trackback from your own site. While I don’t feel this is a screaming deal, it is the kind of deal that is nudging me and whispering “give me a bath and a little tender loving care and I will give you hours of pleasure in return”. Hey, this is a family-friendly website!